This plant is commonly call self-heals, and it refers to plants in the genus Prunella. Herbalist Stephanie Cohen says it can treat skin and digestive issues. Before making it out of the parking lot, Tom Beck, one of the instructors, pointed out the first medicinal plant to the group. "Right here, this is a piece of sweet grass, it's actually pretty long, and it's quite nice," says Beck. 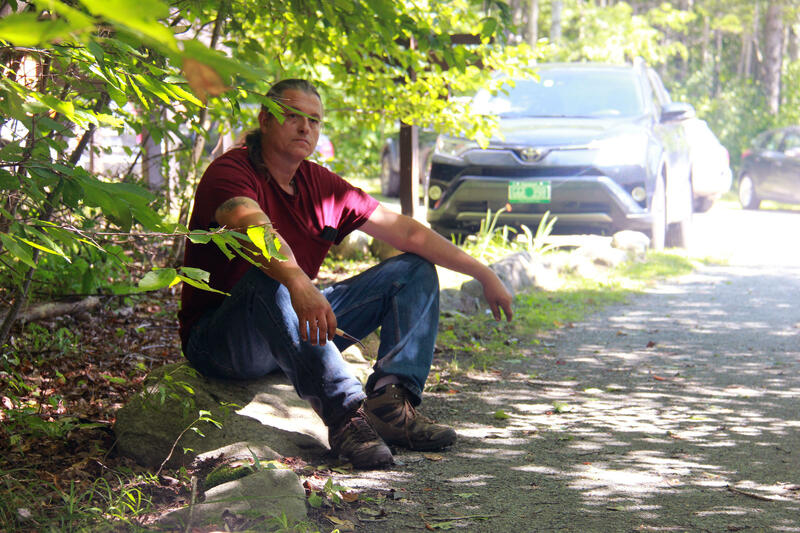 He's a spiritual leader of the Nulhegan Band of the Coosuk Abenaki Nation, a state-recognized tribe in Vermont. Beck has picked up a wide blade of green grass about two feet long, and he's holding it delicately between his weathered fingers. "When you take this and you braid it together, it's your mind, your body and your spirit working together," says Beck. "It's a self-diagnostic tool." Beck says the sweet grass braids are burned in a ceremony, and how evenly the three strands burn is an indicator of how your mind, body and spirit are working together. It can be a reminder to attend to that balance. "If it burns straight across, you know your mind, your body and your spirit is working together equally," Beck says. Tom Beck is a spiritual leader of the Nulhegan Band of the Coosuk Abenaki Nation. He says he learned about medicinal plants from asking indigenous elders. He says sweet grass can also be braided to make ropes and or woven into baskets. Native communities often come together to harvest sweet grass, and then hold the ceremony afterward. It's not something that typically non-native people would attend. But tribal nations who attended the Wabenaki Confederacy meeting in Vermont in 2015 decided that sharing these traditions with all people could be an important step to preserving them. "The chiefs talked about it, what could we do to record our culture, how can we save this for people. That's why this is going on, because we want to preserve our culture," Beck says. Beck says the plant knowledge he's sharing today is a mix of things he's learned from various indigenous elders. All of which was passed down orally. After ambling with the group for the first stretch, Beck hands things over to trained herbalist Stephanie Cohen to lead the rest of the walk. "I really like to focus on practical plants, like things you're going to find often, things that are readily available, things that you can use every day," Cohen says. To that end, she leads the group a bit further down the trail until she spots the first specimen. It's one the groups recognizes right away: blueberry. Cohen explains that the berries contain antioxidant compounds, which may be linked to prevention of some cancer tumors, and also have anti-inflammatory properties. She says the leaves can be prepared to help with blood sugar regulation and diabetes. "Blueberries are some of the most potent medicine that we have in daily life," she says. 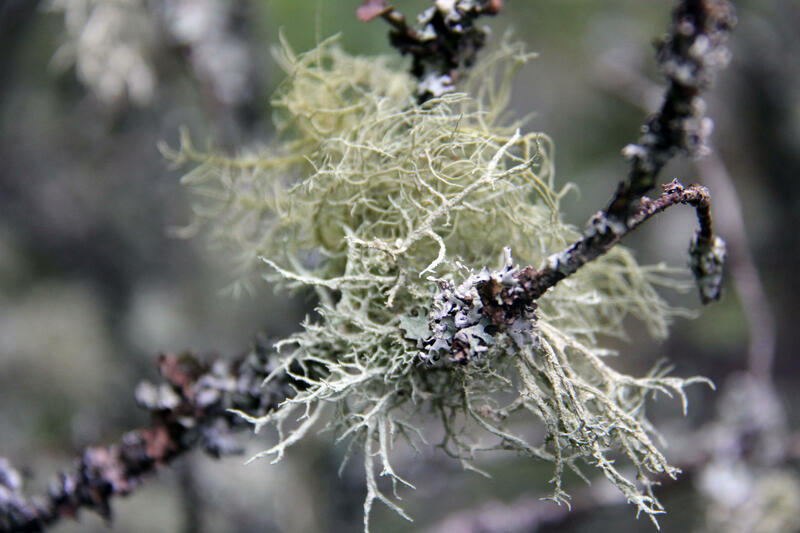 Usnea is a genus of lichen that's sometimes referred to as old man's beard. Further down the trail, she points out a plant not typically found in grocery stores. "This is called Usnea," she says, holding up an airy sage green lichen that's sometimes called old man's beard. Little bursts of it are all over the branches of a fallen tree. "Usnea can be dried and used as a tea," Cohen says. "It is very, very powerful antibiotic for the lungs." The group has varying levels of familiarity with plant medicine, and people pepper Cohen with questions about whether the tea is boiled or steeped. But today's walk is meant to be the first of many, and to serve simply as an introduction to plants that have been used in traditional medicine. Beck says the group has held two walks so far, and is planning additional plant walks. Once those are scheduled, they will eventually be posted on the Nulhegan Abenaki website. Cohen points out that many pharmaceutical companies have long looked at plants and traditional remedies to develop treatments. For example, aspirin was developed using a compound extracted from willow bark. Many cultures used the willow extract for its healing effects on fever, pain and inflammation. "Oftentimes pharmaceuticals are, they find plants that do a thing, they try to find... the primary ingredient that does the thing and then isolate it all by itself, but what's amazing is that the effect is rarely as profound or long-lasting," Cohen says. Cohen makes clear she believes that pharmaceutical medicine is important and has its place in treatment. But she wants to point out the power of what she calls "whole plant medicine, that affects us in profound ways that cannot be entirely mapped out and understood." And it's that rich tradition that leaders like Tom Beck and others don't want to be lost for future generations. The Public Service Board says the Missisquoi Abenaki Tribe can take part in the regulatory hearings for the proposed sale of the Vermont Yankee nuclear power plant.